From the World English Dictionary: foodie or foody (‘fu : dI) – n, pl –ies: a person having an enthusiastic interest in the preparation and consumption of good food. It started innocently enough, substituting Folgers by the pound, Prepared at home for the buying and sipping experience of Starbucks then later Tim Horton’s and Orange Cat. Then I would drive 35 miles to the Galleria to buy Madagascar vanilla at Williams Sonoma (trust me, it really does make a difference). Later, a mini-microplane (I have a medium one, too) allowed me to grate nutmeg (you know, the actual nut) into both sweet and savory dishes. A few years ago I arrived in Southern California on my birthday and my dear friends took me to the Napa rose at the Grand Californian Hotel at Disneyland in Anaheim. We all had tastes of each other’s meal and shared a dish of lobster macaroni and cheese with truffle oil. It was difficult to share because it was one of the most wonderful things I have ever eaten. So good, in fact, that at the end of my conference I went back to the restaurant all by myself, ordered a crisp California Chardonnay, put my feet up on the fire pit (it is encouraged, actually) and ate another delectable dish of the best lobster mac and cheese ever. Period. While I was there I took pictures of my food, and Tweeted about my few moments in culinary heaven. Upon returning home I ran into a long time friend, Dan Gagliardo, at Macri’s (they are all family) and he told me he was following my truffle oil adventure. He told me about a store which was going to sell high quality olive oil and balsamic vinegar. Good luck with that, I thought! Who is going to go to a store just to buy olive oil? Of course, when a dear friend and neighbor told me about the Food Network I wondered who on earth would watch cooking shows all day. Looking back, I think that is when the whole foodie thing began to take shape. Before that I did not know what I did not know. I bought coffee by the pound, vanilla in a small brown bottle, nutmeg in a small tin and olive oil in a huge plastic bottle at Sam’s Club. 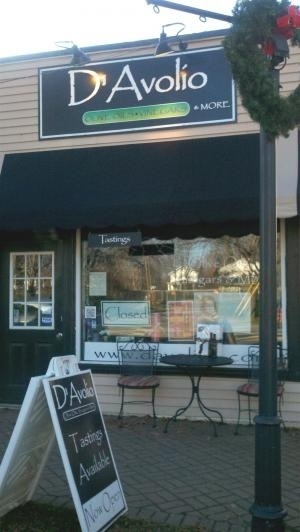 The first time I went into D’Avolio’s in Lewiston I thought my head would spin off … so much oil and vinegar, so little time (and money!). But, after the first taste (on little bits of DiCamillo’s bread) I was done forever. The Tuscan Herb is my go-to oil and I use it on almost anything I cook with. I have even made oatmeal with bananas that are cooked in a little of this oil. The 18-year Balsamic Vinegar is smooth, like butter. It finishes on your tongue like savory syrup but without that heavy feeling. Pair it with the Tuscan Herb whenever oil and vinegar is called for and you can never go wrong. Once I used those items for a while I began going back and buying one thing. Perhaps fruit flavored oil like Blood Orange or Persian Lime or white balsamic vinegar like Honey Ginger or Grapefruit. Each has a distinct flavor and can be substituted in your favorite dishes. Be bold. Try new flavor combinations. If you hate it, order out! If you get the chance to talk to Dan about his stores you will learn about his passion for health and quality ingredients. 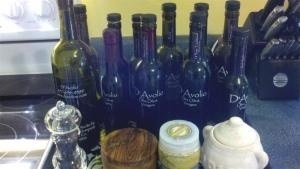 His excitement about the health benefits of olive oil make the mission of D’Avolio easy to understand. He has a devotion to his grandmother which embodies her visceral understanding about good ingredients. Mama D’Avolio knew olive oil was good 100 years before you could read about its benefits on WebMD. Dan carries the family devotion forward. His three daughters are involved in the business which has grown from the store in Lewiston to one in Williamsville, Buffalo and East Amherst. He has many employees who love to share their passion for fine ingredients. Joey (a favorite non Gagliardo of mine) is a wonderful guide and daughter Tiffany wraps a mean package. I so admire someone who can tie a perfect bow. So, was Danny crazy when he told me about opening up an oil and vinegar store? Perhaps a little but the success he has had by providing me with the finest ingredients I can find to prepare food for those I love makes me happy he took this chance. Build it and they will come? Oh … people will come Ray. People will most definitely come.